A few minutes later, news arrived that an explosion had just been heard at Maelbeek metro station, in the European Quarter, very close to where I used to work and to where many of my former colleagues and friends still exert their professions. I spent the next few hours answering calls, emails and messages to tell everyone that I and my family were safe, while at the same time trying to find out if all my friends were OK too. They were. Unfortunately, many others lost their lives, thirty four at the time of writing, and many more -hundreds- were injured, some very seriously. While there has not been any official confirmation of the perpetrators, the New York Times has just reported that ISIS has claimed responsibility for the attack. What is certain is that the people in power, despite telling us that they want to protect us, actually care very little about the safety of their citizens. The response of the Belgian authorities following the Charlie Hebdo and the Paris attacks was to put thousands of soldiers on the streets and raise the security alert. Despite this, and the massive and pretty much unlimited funding that the intelligence services enjoy, two of the most obvious targets for terrorists, an airport and the metro system, were hit. It can only be called what it is, an utter failure on their parts, both in their overall strategy and in the specific response they adopted to “defeat terror”. Have you seen the video of the supposed leader of the US (Obama) being necklaced by the grateful Saudi dictator? Who bears primary responsibility for the displacement of millions of our Sisters and Brothers? How many countries have been attacked and destabilized by the governments of Washington, London, and Paris, and the weapon of NATO? How many millions of people have been victimized by the US ruling class’ terrorism? What responsibilities do civilians of the USA have? James Petras has been right about so many things. Those of you who are well educated and doing satisfying jobs and living in the bosom of your happy families – you dont understand the jealous HATRED that arises in the breast of someone whos been completely marginalised from such happiness. You dont understand what it feels like to be labelled scum and treated like dirt just because you have to claim benefits. You dont understand what it feels like to have no friends – and then to be welcomed with open arms by passioanate people. Does it matter that their religion, their beliefs and their goals are different? Not if they give LOVE. Not if they make their new friends feel cared for. feel HAPPY at long last!!!!! Youve said, in this articel that you dont BELIEVE that anyone could kill another human for the fun of it. It isnt done for fun. It’s done from total DESPAIR which leads to utter FRUSTRATON which leads to pure boiling HATRED. for everybody else. What can you do about it? You can share out the wealth. You can hug the lonely. It starts even before prison. It starts in the school. actually it starts in the heart. You say that we should be supporting Kurds in Kobane, AKA YPG forces. However, the YPG is actively participating in infighting against ethnic Syrian anti-Assad rebels for rebel-captured land. While they have made progress against ISIS, their opposition to ISIS is only a turf war, seen in the aforementioned fight for land against civil rebels as well. Their ulterior motives are what causes many to be hesitant to support them, especially because their offense against the anti-Assad movement suggests a sympathy towards the Assad regime. It goes without saying that ISIS would not exist if Assad had been removed from power early on, and had never been able to spin Syria into such chaos with his military offense against the original civil, peaceful rebellion. We cannot talk about eradicating ISIS as long as Assad is still in power and as long as Syria is left broken and chaotic as he has made it. The YPG represent the interests of no ethnic Syrians, and their support amongst Kurdish Syrians even varies. The YPG 100% represent separatist Kurds who wish for an independent Kurdistan, with no regards for suffering Syrians in the process. Putting them in such a position of power would be an extremely foolish and dangerous move, especially as their ulterior motives for land in the region become clearer and clearer. As the American daughter of ethnic Syrians who spent a large part of my childhood in Damascus, and still has a large number of family members there, I’ve only witnessed over these past 5 years that the West’s understanding of the Syrian people and the Ba’ath/Assad regime is disturbingly misinformed and innaccurate. And these are the people voting to arm troops and bomb cities! You also mention the radicalization of Middle Eastern terrorists originates through a hatred of the West. Indeed, it does, but also through a hatred of their own governments. Their hatred extends to the West largely through Western government’s will to work with and support the violent dictators who have made their suffering so. As long as the Assad regime is allowed to continue, as long as the Syrian people’s anguished voices are ignored as they have been for the past 5 years, you will find more and more young Syrians radicalizing. There is no greater recruitment tool for ISIS than Assad himself. CAPITALISM UNDURSTOOD LONG AGO THAT WAR IS THE BEST BSNESS OF THE WORLD. They,ve developed it at an incredible level, while citizens of the world have been watching tele, they train and arm the terrorist. All death is for capitalism only colateral dammage. Thank you for being amongst the few who think rather than let the media do it for them. You seem rational and compassionate yet you have not mentioned the Turkish victims of the recent bombing in Ankara nor the Lebanese just weeks before the Paris Attack. Surely we like to think, or at least try to think rationally but why do we ask these questions only when the dirt hits the fan that’s the nearest to us? Are we rational or not? I’m not fond of the Turkish government but i’m not fond of the French, British or German neither for their proven rotten foreign policies which are the main cause of these wars and the mess in the middle east. We befriend apartheid entities the way we have done so in the 1980 in South African, we sell arms to rogue states that enforce apartheid, we impose sanctions on those we dislike and support regime change in many parts of the Arab world yet we speak of democracy and human rights as our “civilized” values. Some of us maybe trying hard to be rational and objective but I still think that our hypocrisy speaks louder than our thinking. Why stop at the Kurds? Hezbollah, Assad and the IRG could use a hand also. Unfortunately in the real world solutions are multifaceted, at times unpalatable and almost always beyond the ken of a 5 yr old. If you read these ‘martyrdom’ letters, give agency to the young men who wrote them and not patronise them as ignorant dupes forced into this nihilistic path, then you see an essentialist desire for purity and purpose that has at times infected zealots amongst all of the worlds ‘great’ religions. A combination of robust theological persuasion and concerted pan-regional action will be the only way to draw the poison. This won’t happen until wider actors such as Saudi, Turkey and Iran (and of course US and Russia) have agreed a balance of power in the Middle East. Until then, although the fight against racism and social injustice is an absolute necessity to build a decent society for all of our children, it won’t make the blindest bit of difference to these young men intent on glory. Sometimes we are bystanders in the annals of history, Europe must accept it’s on the periphery and weather the storm. 1. The picture chosen and undertitled along is incorrect. It is the scenery at the back entrance of Antwerp’ Central Station, which has been more or less like this since Paris: four army trucks parked while the soldiers they carry patrol the streets in pairs. 2. 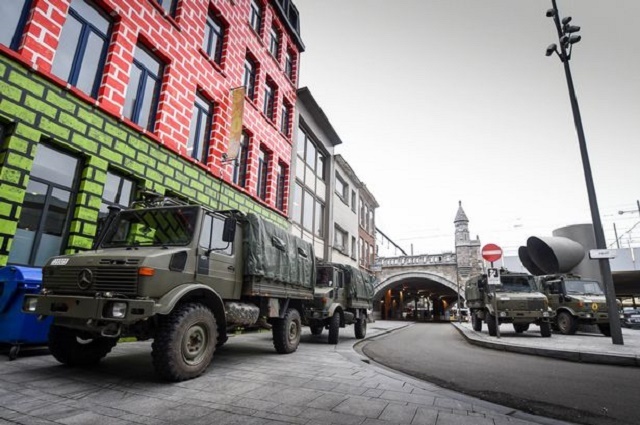 If you try to fit the mentioned ‘thousands of soldiers’ into these four trucks you ‘ll get to a more realistic number of soldiers patrolling Antwerp’ streets on an ‘average’ day – ‘average’ since last november. This makes sense to me. And then I think about the genocide of so many from hitter to pol pot, rawanda. I don’t think it’s retaliatory mixed with strong and clear beliefs purely. The human mind is a spectrum of wellness to illness. Karma is utterly complex in my belief system. The common thread is ignorance of the truth of interdependence. It ranges from minor to major to extreme. But it’s always been so. My country massacred and genocided the Native Americans and we still celebrate the freaking Pilgrims at Thanksgiving. We make “our” deaths important and “their’s” not important. And so the stage is set. When they’re both honored and mourned a new stage is set. It’s hard because it’s us that has to change. You do understand, I hope, that that’s exactly what the most deranged Islamists and ISIS/ISIL/Daesh demand and seek to impose. Broadly speaking, there are two choices. One, the secular values of the Enlightenment that focus on the value of the individual and human freedom as ends in themselves. And second, mysticism in one form or other, inevitably imposed by revolutionary terror. Why do you assume that if there is a ‘total, radical deep rethinking of the way we see society’, the second option won’t prevail? Or is a version of that what you really want, Leftists and ISIS and Hamas and Chavez in one gloriously brutal fleeting ‘anti-capitalist’ explosion of hate before the Dark Ages take over again for a few centuries? Barat says that the terrorists are after us because of the wars in Afghanistan and Iraq, the drones, and Gitmo. Unfortunately for his argument, the terror was going on before any of this happened. And how is Belgium to blame for America’s wars? Sorry you are completely wrong. You cite marginalization and the prison system, the Belgian people and in essence western Society, for the reason why these people commit terrorism. Clearly you are self loathing and overlooking and excusing the real causes. The first mistake is you assume all cultures are equal. The islamic culture is a failed culture. Not Western Culture, the islamic culture. That is the reason that young Muslims commit terrorism. They are from a failed culture that claims for itself superiority with no basis for such claim. The Muslims of this world have an inherent liability, Islam. Young Muslims do not end up in jail because they are marginalised, its because of their cultural background. They are raised to believe they are superior to everybody else, and when confronted with the reality, they act destructively. What want to destroy and blame everybody else who is not a failure. Muslims come to the Western world to escape Islam, they just don’t understand that is what they really are doing. Until Islam’s ideology is reformed, and Western Culture refuses to accept excusers and self blamers for the sins inflicted upon us by the failure of Islamic culture, Terrorism will never end. Unreformed Islam the the cause of terrorism. Apologists for terrorists are perpetuating the problem, for giving Muslims who resort to terrorism the excuse of blaming every other culture, for the utter failure of Islamic culture. When one considers the inherent bigotry of the Qu’ran, the Racism of Muslims and the fact that 60% of all Muslims are illiterate, it made me think how ironic. Stop making excuses and let’s start holding Muslims accountable, for the Islamic ideology that is the root cause of terrorism. Muslims are by far the biggest victims of Islam.